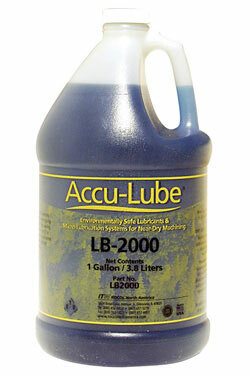 Use AccuLube LB 2000 in all AccuLube brand micro spray systems for sawing, milling drilling and tapping. AccuLube LB 2000 is 100% plant based lubricant designed to replace flood coolants and misting systems with a precision lubricant applicator and highly efficent boundary lubricant. AccuLube LB 2000 is good for machining all metals. AccuLube LB 2000 does not contain any water.